Homepage. This page: A look at the The Commercial Motor magazine from the late 1920s. 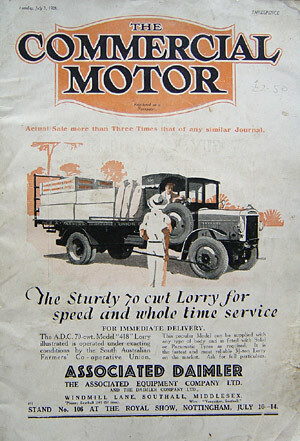 The cover of Commercial Motor for July 3rd, 1928, shows a 70cwt Model 418 Associated Daimler lorry, the one illustrated in use with the South Australian Farmers' Co-Operative Union. Any type of back body could be ordered from ADC, as could either solid or pneumatic tyres. The Commercial Motor - magazine for van, truck, lorry and bus operators (1928). I found this ancient copy of The Commercial Motor magazine in the early 1990s, tucked away in the back of a dusty old bookshop, which sadly closed some years back. I've always been a bit of a sucker for old lorries, vans, and other commercial vehicles. This particular mag was aimed at any operator of a commercial vehicle, whether in road haulage, or passenger carrying, and the industries associated with these categories of road transport. It is packed with articles and wonderful advertisements, for lorries, and lorry bodies, both large and small. In fact the first thing you see is the advert for Associated Daimler trucks on the cover. 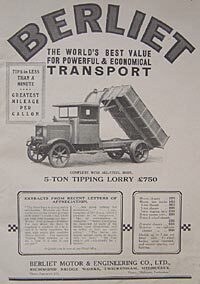 The lorry shown in the illustration is fitted with pneumatic tyres, and has an open-sided cab, something that was the norm for such vehicles, even in the rainy UK. Drivers must have been built of stern stuff in the days of bakelite - no sat nav or in-cab televisions for these gritty road warriors! The first section of the magazine is given over to commercial vehicle advertising, all very much 1920s in their style and text. Names from the dim-and-distant past all feature in here, some of my favourites including the Berliet 5-ton tipping lorry (solid tyres), the 30-seater Superbus from the Bristol Tramways & Carriage Company Limited, Vickers Motor Bodies (front entrance coachwork for Maudslay or Dennis omnibus chassis), bodybuilders Strachan & Brown with their coach roll-top roof, Chevrolet 25cwt & Half Ton trucks, the Pagefield Safety Coach, the 'British built Overland' 10cwt van/traveller's Brougham/Commerce Saloon & 25cwt lorries, and a make I'd not heard of before, namely the Shefflex 2 ton lorry. 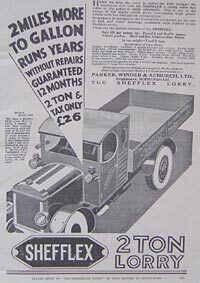 The Shefflex was a dropside lorry, rated at either 2 or 2.5 ton, powered by a 4 cylinder engine. Petrol consumption was 12-14mpg, with one gallon of oil lasting 1,000 miles! The builders were Parker, Winder & Achurch Ltd of Birmingham. Wade further into this wonderful publication and more names from Britain's proud engineering past surface for your attention - Gilford Motor Company, whose coaches were operated by Black & White Motorways, the Carrimore 6 wheel lorry conversion, the 6 wheeler body extension for Chevrolet, Overland and New Ford chassis from the British Longframe Company, Northern Counties bus coachwork, Duff Jacks (not perhaps a name that would be used now for a vehicle jack!! ), Sturdiluxe Bus Bodies from Chester-Le-Street, and the quirky looking Chenard-Walcker tractor, illustrated by a tractor and trailer painted in the colours of LMS, or London Midland & Scottish Railways. One name that you do still see quite regularly at shows is Scammell, and on page 32 is a full page ad for the Scammell Six & Eight Wheelers. 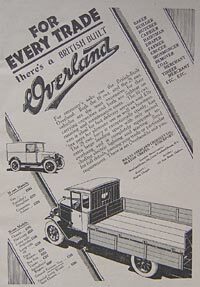 Overleaf is a smart Leyland flatbed lorry, promoting its company's products. Following this section is the main bulk of the magazine - 'recognized in Business Circles as the Leading Journal. The Authority on all forms of Mechanical Road Transport.' - they must have been doing something right, as Commercial Motor is still going strong today - you can read about the new publications on their website, although sadly I doubt there will be many British companies advertising their lorries in there any more. Several pages cover news items relating to road transport in general, including photos of a 3 ton Guy delivered to J & J Morison (Edinburgh brewing company), and a forward-control Associated Daimler on solid tyres that had been delivered to a Peter Jeory of Vine St, in Liverpool. One of the first full articles goes into detail about ambulances used in Birmingham. Two ambulances are shown, one is an Austin 20 with could carry 2 stretchers, and a 30hp Daimler that could only take 1 stretcher. In both cases the driver was largely exposed to the elements, with just a roof and screen to keep the worst of the weather off. Not much fun in winter I imagine. Another member of the fleet is a Ford mortuary van, which is only shown from the rear but looks suspiciously like a Model T, with a box body on the rear chassis. Several matters of road policy are discussed in another article, with some interesting figures for road accidents in London during 1927. In all there were 1,056 fatalities on London's roads, split as follows: 707 pedestrians, 96 vehicle occupants, 249 cyclists, and 4 that were not classified. Any haulage operator thinking of buying a new Vulcan dropside lorry would have found July 3rd's issue invaluable, as an overview of the altered 30cwt Vulcan chassis was given, outlining the changes that had been made following the feedback they'd had on previous vehicles sold. Standard equipment would now include 12v lighting, an electric horn, and a speedometer. A new polished radiator was now standard fitment, offering an increase in cooling for the 30 bhp engine. The gearbox had been beefed up, and now came with four forward speeds. Amazingly, the fuel tank was carried on the dash, with the filler cap outside, just in front of the windscreen. Enthusiasts of vintage lorries will find lots of other information in this magazine to amuse and interest them. A four page spread is given over to a brand new Crossley bus chassis that had been introduced, designed to take 32-34 seat bodywork, while another article discusses the merits of using bent wood in place of sawn timbers when constructing coach and bus bodies. A wonderful body by Hall, Lewis & Co. Ltd is used to illustrate this article, fitted to a Cottin-Desgouttes CMC chassis. Towards the back of the magazine is a further mouthwatering selection of lorries, presented by their manufacturers in glowing advertising copy. For instance, why not choose a new Commer 'for efficient service', and if you were in the market for a tanker body, you could always pop over to the Steel Barrel Co. of Oxbridge, who could build you a brand new wagon tank - a smart lorry used by Pratts Spirit (aka petrol) was shown, fitted with a 1,000 gallon D type tank. Yet more advertisements make up the remainder of the publication, with companies such as Wray's Motor & Body Co., Tucker Armoured Plywood Co. (with their 'scientifically cemented together' bus bodies), John Marston's Carriage Works (for double-purpose and hearse bodywork), H. Parker & Co. roller shutters, Filtrate Oils, Don brake linings, and Dennis Brothers of Guildford, all vying for the reader's business. For anyone who is a fan of classic and vintage vans, buses, coaches and lorries, it is well worth hunting down a few old copies of Commercial Motor, as there is plenty to read, from a time when road transport was still in its infancy, and very different to transport today. The variety of makes and models of lorry in those days is staggering, and of real interest to anyone who appreciates restored lorries of the byegone era. Magazines specific to a particular maker are harder to find - fans of Leyland lorries for instance need to hunt down surviving copies of The Leyland Journal, to find out more about their favourite lorries. The Road Way is another pre-war commercial vehicle magazine featured in this section.